After showcasing the TRK at 2015 EICMA in Milan, Benelli has launched the TRK 502 and TRK 502X at ₹5 lakh and ₹5.4 lakh, ex-showroom. Interested buyers can log on to india.benelli.com and pre-book the TRK by depositing a booking amount of ₹10,000. The popularity of adventure motorcycles is growing by leaps and bounds as all major two-wheeler manufacturers want a slice of the pie. Sadly, this segment currently has limited middleweight bikes, but things are slowly changing as Benelli has decided to join the party with the launch of the TRK 502 and TRK 502X. 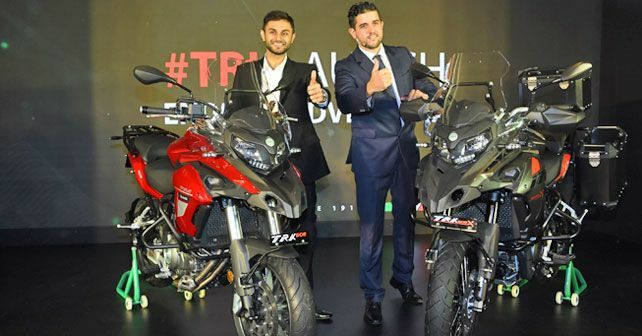 Priced at ₹5 lakh and ₹5.4 lakh (ex-showroom) respectively, the TRK duo will take on the Suzuki V-Strom 650XT and the Kawasaki Versys 650, though the Benelli ADV bikes will be a lot more affordable. Interested buyers can log on to india.benelli.com and pre-book the TRK by depositing a booking amount of ₹10,000. Furthermore, as a limited offer, the buyers will receive a voucher worth ₹10,000 on the day of delivery, which can be used to purchase accessories and apparels from the showroom. Both the TRKs are powered by a 46.8bhp at 8,500rpm, 500cc, which is a twin-cylinder, liquid-cooled, four-stroke, DOHC engine with 4-valves per cylinder. The fuel-injected motor produces a torque of 46Nm at 6,000rpm and is mated with a six-speed gearbox. Based on the trellis frame, both the TRKs come with 50mm upside down forks in front, while the rear gets a vertically mounted mono shock. The front and the rear suspension on both the ADV bikes come with pre-load adjustment. As the TRK is a tourer, it gets 17-inch alloy wheels with 120/70 section Pirelli tyres at the front and 160/60 section Pirelli tyres at the rear. While the more adventure ready TRK 502X gets Metzeler tyres with 110/80 – 19inch in front and 150/70 –17inch at the rear. As it’s a no-nonsense adventure bike, it comes with spoked rims to tackle rough terrains. Both the TRK 502 and TRK 502X use twin 320mm floating discs with a 2-piston calliper at the front and a single 260mm disc with one piston calliper at the rear with switchable ABS. The TRK 502 range is available in 3 colour options – red, white and graphite. Benelli is making a comeback in the Indian market with new Indian partners, the Hyderabad based company - Adishwar Auto Ride India - Mahavir Group. The Mahavir Group has taken charge of sales, service, and distribution, from the Pune-based DSK Group.